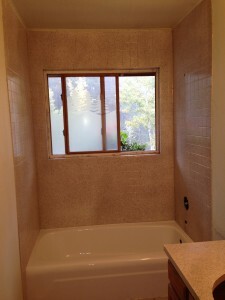 Bathtub Reglazing in Denver – how to choose the right company! Bathtub reglazing is a very complicated process. Don’t be fooled by reglazing terminology, there are specific things to look for in your selected bathtub reglazing specialist. We will be looking at company requirements/policies, the correct reglazing process and customer feedback. First, some states require specific certification to be able to provide reglazing to their customers. Call your state’s Business & Licensing Division to confirm if your area requires any special certification. Our state of CO doesn’t have any additional requirements, as of now. Any and all contractors/subcontractor should be insured and bonded if you want to protect your home. If an accident should occur and they don’t have insurance you may need to spend extra cash to repair your home from any mishap that may occur. Accidents do happen, be sure the specialists that enter your home have coverage. A legitimate bathtub reglazing company will provide the best safety equipment to their specialists. Full body suits, protective gloves, eye and ear protection and a full-face atmosphere supplied respirator (i.e. A respirator that covers their full face and supplies fresh are to the individual). The chemical itself is not toxic to customers, but specialist are exposed to the material on a daily basis. If the company provides inadequate safety equipment, either they are 1. Not using the appropriate materials for the refinish or 2. Not providing the necessary equipment for their specialist as they should be. Either way, take this into account. A solid bathtub reglazer will provide you a written warranty on a standard refinish. Review the term and the maintenance requirements for this warranty. There will usually be general cleaning instructions provided on the companies website. Consider the length of the warranty. I know money talks but if you need to spend the same amount (maybe more) to strip and reglaze the surface again in another 1-3 years, it may be worth considering the longer warranty. Food for thought. Each bathtub reglazing specialist will have a slightly different process, but there are 2 things that MUST be done to expect the best results. 1. A porcelain bathtub must be acid etched. This is one of the first steps to complete and it is crucial for the adhesion of the primer coats. Now, some will call it an “acid wash”, ask for further clarification. General cleaning materials sold at your local general store have an acid in them (i.e. Scrubbing Bubbles, etc). That’s how that particular chemical cleans (which you should never use on any high gloss surface. Never ever. It eats the porcelain. But I’m jumping ahead of myself….). So when a company says it’s using an acid wash, it’s just a commercial cleaner. You want an acid on the porcelain. It opens up the pores in porcelain, removes any soap scum and body oil, eats surface rust and roughens the surface so the primes has something to grip too. You wouldn’t want to stain your hardwood floors without sanding them. Same concept here. Be sure they are using an acid. That’s crucial. 2. Urethane Acrylic top coat is the only material on the market that you should have your bathtub top coat reglazed with. If the company you are considering uses an Epoxy top coat, don’t even bother. Epoxy’s are an incredible material for the adhesion, but they are not created to receive constant water. An Epoxy top coat can flake on you within a couple months to a couple years. They aren’t proven to last in this particular industry. The Urethane Acrylic top coat mimics porcelain and is the most durable material, second to porcelain itself (which is baked on). When the finish is well taken care of, you can usually expect 10 – 15+ years out of a refinish if the company follows these 2 crucial steps. Ask for references! Call those reference! Ask about their experience with that company. Were they on time? How was the communication? Where they educated and informed over the phone/in person? Did they feel like the company was giving them a sales pitch or actually looking out for their best interest? 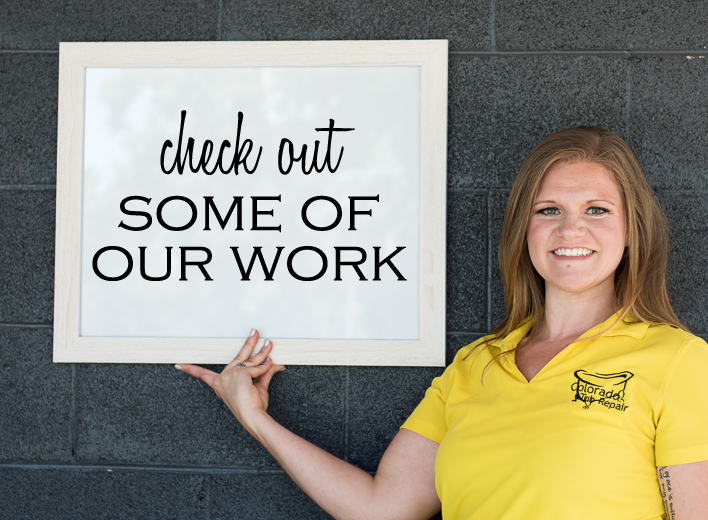 Yelp, Google +, BBB, website testimonials, Angie’s List, Facebook, LinkedIn….there are many more online tools you can use to review a companies performance before you decide to hire them. Take advantage of that information at your fingertips! I hope this helps in your search for an bathtub reglazing specialist. If you need any further assistance or have any questions, don’t hesitate to call. This is what we do. Bath and Shower Safety – how to avoid a slip and fall accident in your bathroom. It never a fun topic, but today we are going to be discussing slip and fall injuries in the bathroom… Why are we going to play debbie downer and talk about this? Because it’s important and the statistics are pretty grim. We want to keep you (and your loved ones) safe, so let’s look at ways to reduce your odds of having a slip and fall injury. 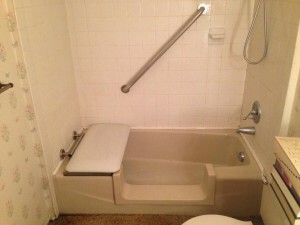 Grab Bars – These may be installed vertically, horizontally, or diagonally (see photo below) depending on the type of tub or shower, and the bathing preferences of the customer. Shower Seat – this can be gam changing for people with mobility issues, there are a variety of materials from natural woods to non slip plastics, and they fold up very nicely as well, so the option of bathing is not eliminated. Tub converted to minimize slip and fall injuries. Flooring – In our decade of experience, we have experienced several flooring options. Sadly, most of them are not that great of options. But we will discuss each one along with the pros and cons. Bathmats – A bathmat can provide good quality support on an existing slippery surface. Two kinds are made: one with suction cups, one without. The bathmat withOUT the suction cup on the bottom work well, but every now and again it may scoot around on the bathtub surface. So be mindful of that. After each use, you’ll need to remove the bathmat. 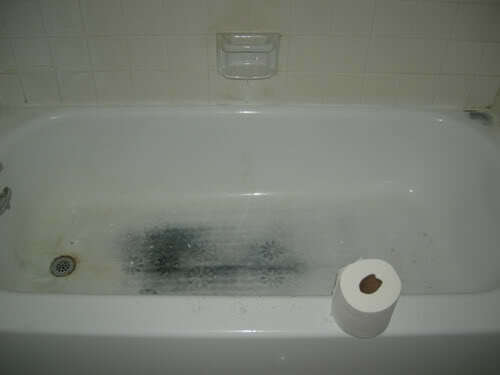 Water that sits under that mat will etch into the bathtub surface, causing it to become harder and harder to clean. This Bathmats can be a little more tricky to find, but are recommended over the alternative when it comes to the life of your bathtub. The bathmat WITH the suction cups tends to be a preference among our customers, but is one of the worst non-slip surfaces to use. The suction cups give consumers peace of mind when it comes to slipping, but the suction cups quickly destroy the bottom of any bathtub. Again, the water under the suction cups (in a concentrated area with trapped air) along with any under the mat Itself, etch into the tub. Applying weight to that suction cup area, forces the compressed air and water aggressively a crossed the surface of the bathtub, causing the water to etch into the bathtub. (Think about it, water carved the Grand Canyon, what do you think it’s doing when it’s trapped in the top of you bathtub surface) “I’ll remove it after each use.” It’s a thought, but the constant pulling of that suction cup pressure several times daily does just as much damage. This tub was destroyed by bathmats and the decals. Stick On Bath Decals – The concept for bath decals is a dud. It’s basicly, sticking stickers on a slick surface that experiences constant water. Most of the negative comments made by consumers address the difficulty in getting the decals to stick. 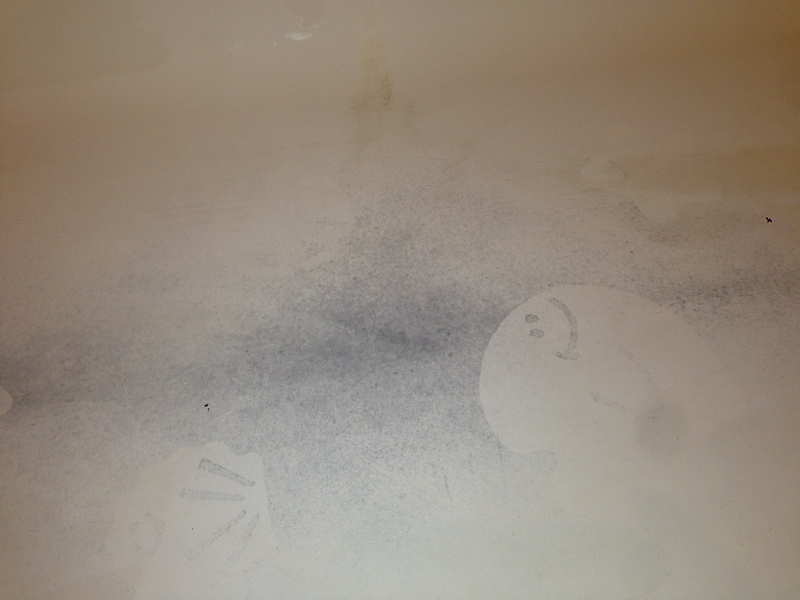 If your lucky enough to get them to stick, know after you remove them, you’ll need to get your bathtub refinished. The decals imprint the on the tub; when removed the decal is still seen in the bathtub floor. The only way to repair this is to refinish the tub. Non-Slip Surface added to bathtub – This is the best option for avoiding a slip and fall, in our opinion. It’s built into the finish. It doesn’t need to be addressed after every use, like you would with a bathmat. There are fine granules, smaller than sand, that are mixed into the primer and placed in a uniformed patterned on the bottom of your bathtub. Primer is then sprayed and then the top coat. It creates great traction, but not enough to where laying in the tub for a bath won’t be uncomfortable. Regular cleaning will be required with this option. The small textured surface is rough and can collect dirt if it’s not cleaned regularly. Please be smart about a bath and shower safety. If you have any specific questions, don’t hesitate to contact us. 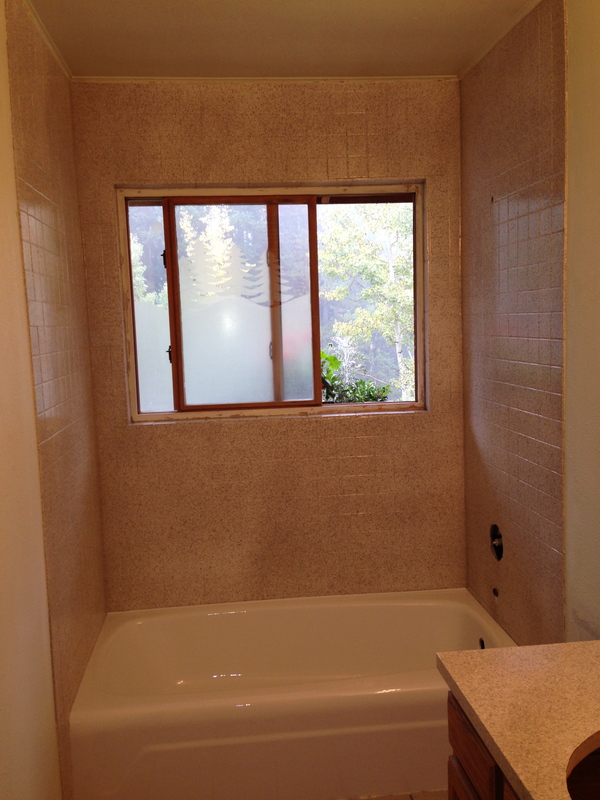 Testimonial for Colorado Tub Repair – Tub and Tile Refinish. A Testimonial for Colorado Tub Repair. We love to fluff our feathers. “Wow! What a spectacular job you folks at Colorado Tub Repair do! The job was more difficult than expected but you took it in stride and worked very hard and now our bathroom is a joy to behold. 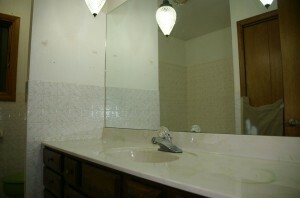 The bathtub looks brand new and so does the tile surround and the vanity. We’ve hired contractors before for other work and were extremely disappointed in both their attitudes and work so we were crossing our fingers. So we were SO delighted to find your company very professional and conscientious. All our expectations were met and more. You truly go the extra mile! We are SO pleased and now proud of our bathroom, we’ve actually been inviting friends to come take a look! 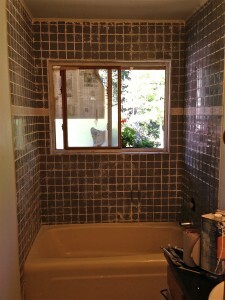 Ronnie & Marilynn had a tub and tile surround that was refinished incorrectly. It was an outdated color and had drips down the sides. Colorado Tub Repair stripped both the tub and tile, refinished the tub a classic white and the tile/vanity with a multi-color finish. It’s beautiful! Changes the whole atmosphere of the bathroom. What are the advantages of Tile Replacement vs. Tile Refinish? Both options have advantages, but which option would be best? Well, let’s look at your situation. 1. Why are you wanting to change the tile? 2. Is the condition of tile and grout in good shape? 3. Are there any loose tiles? Tile Replacement can be necessary. 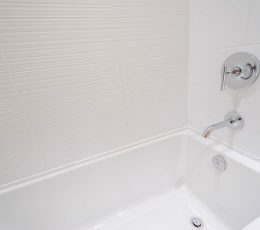 For example: If the tile is loose and/or falling off the wall, there is a good chance that the tile is not supported to the correct backerboard. Many attempt use drywall as a substrate for the shower surround. DO NOT DO THIS. There is no moisture barrier between the tile and drywall/framing. When water reaches behind the tile, it will disentegrate the drywall and possibly even the framing. That’s a whole other mess. Remove one of the loose tiles gently and be sure there is a backer board behind it. If not, it’s best to remove the tile and start from scratch. But this time, do it correctly with some backer board and a waterproof membrane. Situations like this would require the tile to be replaced. It is a more expensive option, but doing it correctly will save you more money in the long run. Getting the Tile Refinished is a benefit in many ways. 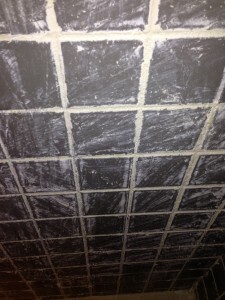 You first need to look closely at your tile and grout lines. 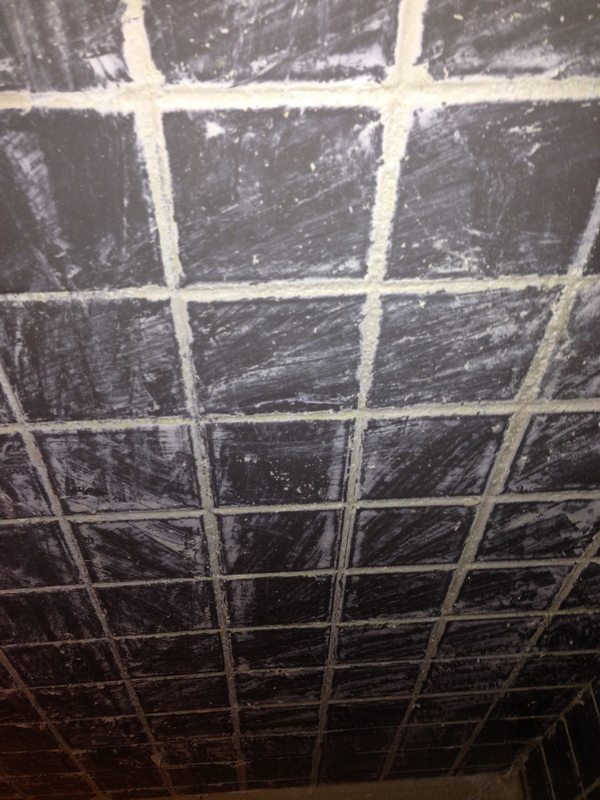 If the grout lines are hidden or very worn, you will need to get it re-grouted before you refinish it. Small cracks or chips in a few tiles can be easily fixed. 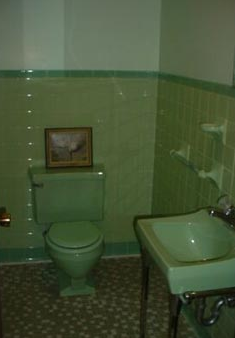 Assuming that the tile and the grout are in good shape, the dynamic of the entire room will change with a tile refinish. When the finish is done properly, you can expect 15+ years out of it, before it will need to be refinished again. It is custom too. You can select classic white, an almond to match your sink and toilet or one of 25 multi-color finishes (wink, wink). The Tile Refinish can be completed in a day and will only require 24 hours to cure. Then your set. If your unsure about which option would be best? Call us out and we would be happy to take a look. Reglaze or Replace my outdated countertops… Which one makes sense for my bathroom? 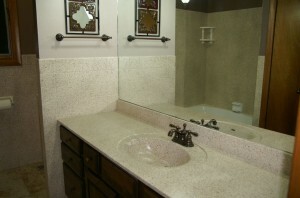 Countertop refinishing, a fast, practical and budget friendly way to give your bathroom a facelift! This color haunts our nightmares. Replacing countertops often involves major construction, contractors, and a lot of money (usually in the 4 figures) and headaches… Vs reglazing where within one day, you can have the whole dynamic of your room change with a counter top refinish. By reglazing them with a modern multicolor finish, you’ll update the entire room, at a fraction of the cost of replacement. There are 25 amazing colors to choose from. Customize your countertops to your liking. 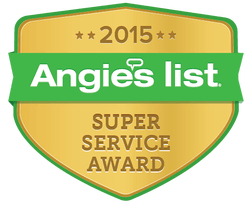 Colorado Tub Repair is proud to be the top counter top refinisher in Denver, CO! Okay, I’m sold, so how does the process work? First, the large appliances will be removed, if possible. Then the entire room will be masked off. Every square inch of the countertop will be sanded with a range of aggressive sanders. The counter top is cleaned, prepped and a bonding agent is applied. Primer is sprayed, followed by the multicolor finish. It takes 1 to 1.5 hours for the multicolor to dry. After the chemical is dry to the touch, a protective sealant is applied. Wait 24 hours, have a bead of silicone applied around the edges and your all set. Go Green, save money and REFINISH YOUR COUNTER TOPS!